I used to work in youth ministry for a para-church organization called Youth For Christ and while I had a blast and really enjoyed my work, it was demanding of not only my time, but my energy as well. At that time my wife not only worked full-time keeping the books for the same organization, but was a full-time student at Indiana University. From very early on in our marriage, like most sane human beings, Kelli wanted a dog. I kept telling her no. Given the lack of time and energy in our lives, it didn’t seem like the right thing for us, or a dog. So, naturally, when Kelli entered into her final semester at IU she started looking for a puppy. We had both decided on a chocolate lab, and on those long nights she should have been studying or working on papers, I would find her sitting up in bed, looking for a puppy. And did she ever find one. Being the Packers fans that we are we decided to name him Lambeau. 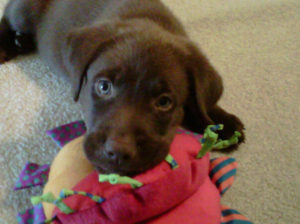 When we first got Lambeau, I had all of these grand dreams for all the things I would do with him. I wanted to take him to the lake, and teach him tricks, learn to catch a Frisbee. I even had this dream of teaching him to play football. Literally, I wanted to line up in a line, I say “hike” and he runs out for a pass, catches it in perfect stride, and runs for that touchdown. The humans of course having no way to catch him, because not only is he fast, but he is elusive, he’s a dog. But I never taught him to play football. Mind you, this was before my trainer days and the only thing I could get him to do was take a hand-off and follow the lead blockers. Some dogs are just meant to be running backs, not wide retrievers. See what I did there? We did take a clicker training course at PetSmart which really should have gotten us on the right track. But we were kind of just doing what we read, or learned from others as we went. Then one day, when he was about four months old, a friend of ours mentioned search and rescue (SAR) work, and put us in contact with a local team. We went to a training and they did a few preliminary games with Beau to see whether they thought he would be cut out for the work. Not only was Lambeau cut out for it, but he loved it! He lived and breathed SAR. I remember in those early days, someone on the team had told us, “There are many ways to do things with your dog, not just what this team teaches. So, go out and explore and figure out the best methods, not just this one.” It was the soundest advice anyone could have given us at that time in Lambeau’s development. If only we had followed that advice. We were taught very quickly that when working, our dog Lambeau was not allowed to be a dog. He wasn’t allowed to get distracted, or take a dip in a hot creek during a cool day, or sniff deer poop. When the dog is working, that is all he is allowed to do. Since we were such new puppy parents, we were totally moldable, and we were quickly molded into something we never wanted to be, but were taught that we should be, “the finger of God on your dog”. So Lambeau, like any hyper lab had his share of normal dog issues. He’d counter surf for food, bark at other dogs, and pull on his leash, eat goose poop, chase a squirrel up a tree. All of these normal dog actions were 100% unacceptable. So, what did we learn to do? We learned to buy a shock collar, and a pinch collar. When Lambeau jumped on the counter? ZAP! When he pulled on the leash, PINCH! When he was working and stopped to eat the poop that some woodland creature left behind? ZAP! And that is how we “trained” Lambeau. But little did we know that while we thought we were teaching Lambeau to behave and follow the rules, all we were really doing was to fear us. And that is not what we ever wanted to our precious puppy. 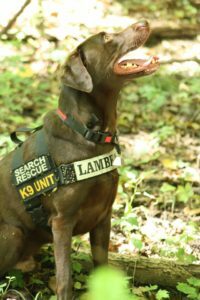 So Lambeau’s SAR discipline is Live Area, which means that we go to an area, give him a cue (“Go Find”), and he leaves us and searches for anyone in the area he can find. Once he finds someone he does an alert (barks at us) and then when we say “Show me” he takes us to where he found the person. So, after a couple years of hard work, blood, sweat, and tears, it was time to certify Lambeau through the Indiana Dept. of Homeland Security. It was during this time, and during his certification attempts, that Lambeau simply decided, that the game wasn’t worth playing anymore. He would go into the woods, and just not look for people anymore. On those occasions when he decided he wanted to work, he would find the people, and then just not alert. He would quit. Kelli and I were devastated. How on earth can a natural like Lambeau suddenly lose his ability to do this job that he loved so much? Our teammates gave us many things to try, all of which ended in more guessing and never quite figuring it out. It looked like Lambeau was going to wash out. Our SAR career was going to end before it even started. Then one day we were invited to train with a team called Midwest Search Dogs (MSD) located in Indianapolis. We had met the leadership of the team a few times and they were familiar with Lambeau’s training woes. This team had one major difference from our own, and that it is the only SAR team in the USA, that forbids aversive training methods with the dogs. So, when he happily accepted their invitation, they informed us not to bring the aversive collars to training. I will never forget the first time I worked with MSD. I was running Lambeau on a small problem covering a few acres, and he stopped to sniff some deer poop and I was immediately embarrassed. I yelled to him, “LAMBEAU LEAVE IT! GET TO WORK!” and one of the team members asked me why it was so bad for Lambeau to sniff something as dogs will do. They encouraged me to relax, let him be a dog and just keep moving. They explained that he would eventually leave the poop and that I should praise him when he does. This moment changed everything. I was taught in subsequent weeks that I was allowed to let my dog enjoy himself, and the more I praised him for doing what was right, the more he was willing to ignore the distractions. We decided that we would never touch another dog with a pinch collar, or a shock collar in all of our lives. And in the eleventh hour, when we were on the brink of ending Beau’s career before it started, he got his alert back. In what we were unable to do in nine months of trying with punishment-based training, we were able to accomplish in just two weeks without the punishment. And in the following months, Lambeau passed his certifications not only with me, but Kelli as well. 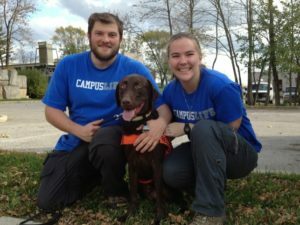 He was able to obtain his Canine Good Citizen Certification and has renewed his certification multiple times. As I sat there and watched that boy working baseball with his dad, cause let’s be honest, there was no playing involved. I couldn’t help but think that no matter how much this boy loved baseball, he was well on his way to hating it, especially if his dad continued to berate him for mistakes, instead of praising him for effort and success. This little boy was a kid, who should be allowed to be a kid. The same applies to your dog. Whoever said that a dog should know how to walk on a loose leash, or not bark, or not jump on people, or dig holes, or chase squirrels? That is what they are born to do. But what we can do, is teach them that the alternate behaviors are far more rewarding. That way, they no longer avoid behaviors because they fear you, but want to do what you want because it is rewarding. This is what brings about the highest level of happiness in your dog. Still don’t believe me? Then next time your boss yells at you for the mistake you made, and you feel like the things you do well go unnoticed, remember this story and ask yourself… Does it make you love your boss or fear your boss? Does it make you enjoy interaction with him or avoid interaction with him? If you have a boss that you absolutely respect and enjoy being around…is it because they berate you for mistakes? Or is it because they appreciate what you are doing right? I bet I know the answer to all of those questions. I am a cross-over trainer. I used to use aversive training methods, and now I only use positive ones. I wasn’t guilted into it, I wasn’t forced into it. I saw the effect it had on my dog, and see the damage it creates. Whether it’s a harsh correction, a leash pop, a shock collar, pinch collar, or choke chain, they all instill fear of failure, not trust. If you are one of those people that feel like you may be doing the same disservice for your pup, there is still hope. We are here at Uptown Pup to help you turn the ship around, with no judgement, because I was there once too. The bond I have with Lambeau now is so strong, that all I want is for you to know it with your own dog as well.